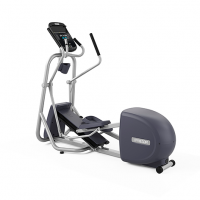 The EFX® 245 brings Precor technology to your fingertips and the smooth feel of a fitness center elliptical into your home. Personalize the display of the color touch console, make listening to your favorite tunes easier with the on-screen music controls and console headphone jack. Let the EFX choose a workout for you based on your goals and progress or select one of the 25 preset workouts or 16 that you create. Comprehensive heart rate monitoring and premium club-style controls for ramp angle and resistance.